It´s worth mentioning a third factor known as on-site SEO or, to use a better word, technical SEO. Technical SEO comes down to increasing the loading time of your pages and fixing duplicate content, among other things. In short, it looks at optimizing the site as a whole, which we´ll cover in a separate article. 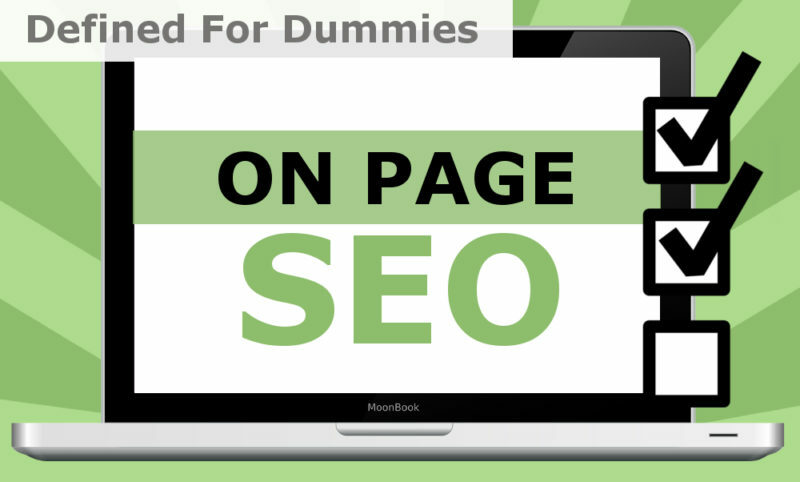 Today, we´re talking about on-page SEO. We´ve tailored this toward people who´re just starting out, with the focus of this article on how to make a webpage search engine friendly. Include your keyword in the title, the closer to the beginning the better. Use your keyword in the URL, like I´ve done on this page. H2 tag, insert your keyword in full or, if that looks unnatural, use a variation. Alt image tag, when you upload your image to WordPress, you can insert your keyword there. Rename your image file to the keyword you´d like to rank for. Use your keyword near the top of the article and once towards the end. Write in a natural way, don’t repeat your keyword numerous times just for the sake of it. My target keyword is: Beginners Guide to On-page SEO. Since I´d also like to rank for variations like ‘On-page SEO beginners guide’ or ‘On-page SEO for beginners’, it doesn’t matter a whole lot whether I use the exact phrase or not. For Google, they are both the same thing. H2: My phrase is four words long, so I don’t use it in any H2 or H3 tags. I did insert ‘on-page SEO’ into one of the H2 tags as you can see above which is sufficient in this case. Alt tag: I inserted my phrase in the featured image alt tag as this page has no other images. Top bottom: I used a variation near the top and one near the bottom of this article. This article looks quite natural, right? Definitely not keyword stuffed. When it comes to keywords most people tend to over-think it. When you write in a natural way, Google will know what your page is about. All you have to do is mention it naturally in the places I´ve recommended and that’s it. If it’s a long phrase like mine, vary it up as best you can. See, for example, how I rephrased my keyword in the URL and the title? I did that on purpose to make it look more natural and to increase my chance of ranking for variations. I have an affiliate site in the cooking niche with a page about rice cookers. This page had the word ‘brown’ mentioned just ONCE on the whole page. It wasn’t even connected to the word ‘rice cooker’. Still, my page ranked at #1 for ‘brown rice cooker’. How is that even possible? I hear you say. Well, Google only needs half a word these days to know what the page is about. My site had a lot of authority (read: backlinks) so, despite poor on-page SEO for that particular keyword, it still beat all my competitors. You´ve probably seen these words used a few times here and there. If not, no problem. Years ago, people would simply repeat their keywords to improve their rankings. Nowadays, the Google algorithm is so advanced that an approach like that would actually hurt your rankings. Instead of repeating the same keywords, it’s better to come up with synonyms and related keywords to include on your page. These are known as semantic, or LSI, keywords. Definition: LSI keywords (Latent Semantic Indexing) are basically keywords that are semantically related to your primary keyword. Contrary to popular belief, they are NOT just synonyms or keywords that are similar in meaning. A good example of an LSI keyword is Technical SEO instead of On-page SEO. They aren’t synonyms of each other, yet they are still related. The more related keywords you have, the higher you will rank in Google so pay close attention to them. Copying and pasting the list, like I just did here, is not the best practice for improving ranking. A better way would be to simply pick some of the phrases and write around them in a natural way. When I look at that list, I see a few nice words that I could’ve used like: advanced, Google, how seo works, tools, certification, analytics, tips, tricks, tutorial, techniques and so on. I´ve probably used most of them already without even realizing it! That’s what tends to happen when you write for people instead of search engines. In the past, people wrote a single article for every keyword they could find, including slight variations. And it kept on going and going, rather spammy if you ask me. Nowadays, it’s much better to combine as much content as you can into one post / page. The less posts you have, the easier it will be when it comes to building links. It also lets you rank for many more keywords than if you were to spread your efforts across multiple pages. Let´s take a look back at our original sample. Instead of doing it like that, I would keep the category but simply name it ‘reviews’; and I definitely wouldn’t try to rank that category. Obviously, I could also insert all those product names into my main pillar article but, if my site is all about rice cookers, I´d like to have more than just one page. If it were a cooking site on the other hand, it would be perfectly okay to cover it all in one article. Besides, those keywords with the exact model in them tend to have very large search volume. A more in-depth review is not a bad idea to specifically target a model which comes in many variations. I would also point backlinks at those pages to increase my rankings even more. An extra-benefit of having separate pages is that you can internally link the pages together. You can even link from your pillar / main article to independent reviews for people who want to know more about that specific model. I personally let the search volume lead me. If a keyword has 8100 searches per month I´d write an in-depth article on it. You’d be surprised how many models have thousands of people searching for it each month. I’m not kidding. Keywords like 3-cup rice cooker generally only have a couple hundred searches at most. That means you can give your main article a nice, SEO friendly, hierarchy by dividing it into cup size, brand or other specifics. So how come I don’t dedicate pages to let’s say Panasonic or Aroma rice cooker, which also have a high search volume? The simple reason is that those keywords tend to be a lot more competitive and they don’t tend to convert that well. Only if I was ranking at #1 for every imaginable phrase would I consider writing detailed pages on specific brands. Don’t make it any harder for yourself then it has to be is the lesson to take from here. People love talking about keyword density, but no one can agree about how best to use it. One person says you should use it max 1% of the time, while others claim max 5%, and then another person comes by saying 3% is the optimal number. Then, these same people calculate it all wrong. If their keyword was a 3 word phrase and they mentioned it 30 times in a 1000 word article they said my keyword density is 3%. They forgot that the keyword consists of 3 phrases, so to reach 3% they should’ve only mentioned it 10 times. Heck, even some of the tools online were programmed in such a poor way that they´d spit out the wrong numbers. one word: Use it as often as you want, it doesn’t really matter. two words: I can’t really put a limit on this either but stick to <1% perhaps? three words: I wouldn’t use it more than once every 300 words. four words: Use variations like I did and only use it max once or twice in the page. five+ words: Putting it in the title, URL and H1 tag should be sufficient. That’s pretty much common sense right? The longer your phrase, the less often you need to mention it. Instead, just sprinkle single words throughout your article. There’s a lot of doubt in the SEO community whether linking out to authority sites help. There are some case studies on this topic, however most are rather vague and I definitely wouldn’t call them scientifically under build. The answer to that question is No, definitely not, so if it doesn’t hurt you could just as well add some authority links and perhaps it helps a little bit. Same like I’m doing right now, I honestly forgot a few things that (may) have a positive impact on your rankings. Updating your page is definitely one of them, especially if your page is rather old and has experienced some drops for your main keyword. I’m not saying you should update your post like once a week, or even once a month, but you could consider updating your main pages say twice a year. In the IM community people love to talk about content upgrades, but in such a way that it’s hidden behind an email opt-in. This obviously won’t help your page in any way as Google won’t be able to access it, unless you add specific code to allow the user-agent Googlebot on that part of your site. I’m not exactly sure how to do this though but I will look into it and once I’ve found out I will update this post again. I hope you enjoyed this beginner´s guide to on-page SEO. If you have any questions, you can comment below or, if you´d like to know more, you can also join our Facebook group over here: Content Hourlies – SEO Tips & Strategies. ps: By the time I upgraded this post my next post is ready as well, have a look over here or bookmark it for later: ‘How to Improve Your Rankings in Google‘, in that article we talk about off-page SEO, or better said building backlinks to your site. Though On-page SEO is the foundation, links are still the #1 ranking factor. It’s one thing to explain a concept, it’s another thing showing that the concept actually works. When you search in Google for ‘Onpage SEO for beginners’ we rank at #2 – that wasn’t the case when we published this article as things take time, and links are obviously an important ranking factor as well. We also rank for variations like ‘beginners guide to onpage SEO’ and dozens of other versions on the first page of Google. This site hasn’t attracted a whole lot of backlinks yet so this shows you the true power of on-page optimization.